Are you looking for a great deal on a bass guitar and don't want to have to spend sticker price for an instrument? N Stuff Music's used department has got you covered. We are the go-to used department for bassists both amateur and professional in the Pittsburgh and tri state region. This is because our customers know that we pay attention to both providing quality pre-owned gear that is of full performing capability and also at an affordable price. Here at N Stuff Music you can also bring in any used gear that you would like to sell either on consignment or trade-in. 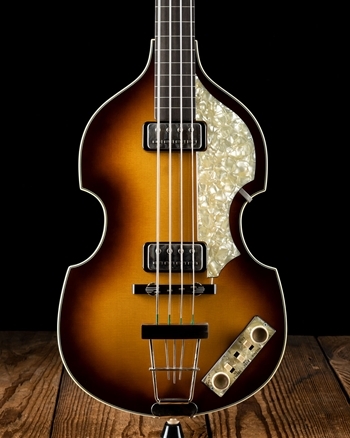 In our used selection of basses you can always find a wide range of style, brand, and price. If you're looking for a first bass either for yourself or someone else we often recommend shopping used because it will give you the chance to get a good bass but for a favorable price that beginners are more comfortable with spending. This is also a great option for guitarists or other musicians who would love to have a bass around to play without buying a premium level instrument. You can also find a variety of intermediate level instruments that are made of quality parts and craftsmanship but priced at a much more affordable price than elite level instruments. But, you'll be glad to hear that you can certainly also find elite and custom shop level basses here for prices that you'll never see brand new. And at N Stuff Music when you buy used you can be sure that you are receiving quality unlike many other music stores. One of the cool things about shopping used is that you may stumble upon models or brands that are unfamiliar to you and peak your interest. We fill our used department not with just companies that we are a dealer for but of any brand that may potentially provide value to future customers. So check back often to see what products have been introduced to our used department so you can find the right instrument. Are you looking to consign a piece of gear? No problem, bring it on down to us and we can get the process started promptly. For any used gear that comes into our store we make sure to put it through rigorous testing so we can ensure that it is in playable and fully capable condition to be resold to another customer. If you are looking to trade-in your gear so you can quickly get rid of it and get money towards another piece of gear you're in luck because we do trade-ins as well. Trade-ins are a great way to get money off of your next purchase. For the best selection of used basses around visit us at N Stuff Music. Like any of our products, you are welcome to demo these and figure out which you like the most. Just tell us what you'd like to demo and we will get you set up and ready to go.